Today is the third and final week of the Spring Into Action project party and I get to share my desk area, as complete as it is thus far. My goal was to get it organized and to lighten and brighten it. I was so excited with my various finds while also using what I already owned. Here is a glimpse. 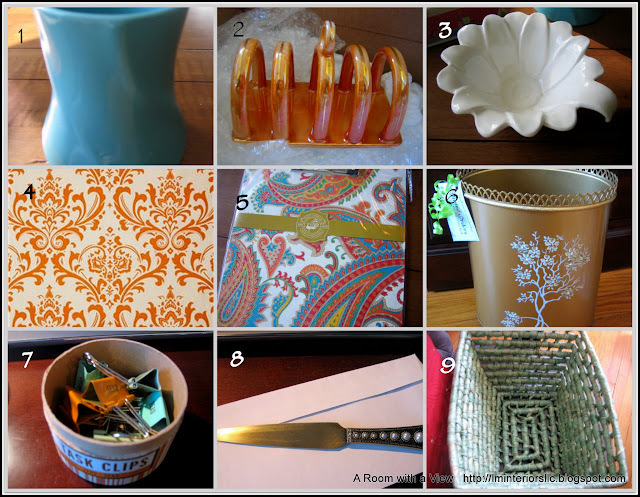 These were the pieces I decided to incorporate. The clipboard being the piece with all the color inspiration I thought I would use. Some more pictures of the space. (Warning - you will see wires below the desk. I did not attempt to hide them for the purpose of taking pictures this time. We have been having some internet/phone issues so these have been left accessible for the time being). Nailhead trim strip on Premier Prints Traditions in Natural/Sweet Potato fabric (from fabric.com) along entire back panel. and for the kids' school paperwork on the right. I also found a smaller pocket for the school directory so that it is accessible and there is a home for it. Vintage Etsy toast rack now a letter holder. Flower vase from Goodwill now a pencil holder. Floral bowl from Goodwill used to hold Post-Its. I added some white mini roses in a silver jug from an old tea set I own. Glass heart-shaped paperweight, one of a set of 3 from One Kings Lane bought a while ago. In the hutch above the desk, decorating and design books, organized by color, and a basket to hold incoming mail. I used sample fabric I had on hand - which coincidentally coordinates with the colors being used in the space - as a backdrop for labels. Filing cabinet and hutch on the side of the desk holds cards in a basket and magazine holders for subscriptions and catalogs. A bill sorter and a decorative plate made for me for Mother's Day a few years ago. Vintage Hollywood Regency waste bin from Etsy below desk. I hope you like this space as much as I am loving it. My desk is more certainly organized and so much more cheerful now. On a different day I will share the rest of the space - behind the doors of the hutch and the drawers below the desk. My work for this room is not complete. I have yet to share the other side of the study with you. It is another project and has a very special piece of furniture. Another time. 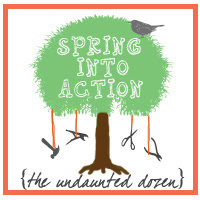 Do stop by these other lovely blogs to check in on their reveals for this fun Spring Into Action party. Thank you, Linda, for coming up with the idea to motivate each other through these past few weeks. It might have taken me longer.